This is the wave of the future. Fluorescent bulbs, the kind that are supposed to replace incandescents, will just be a stop on the way to environmentally-friendly lighting. For one thing, fluorescent bulbs aren’t all that green when you take their mercury pollution into account. 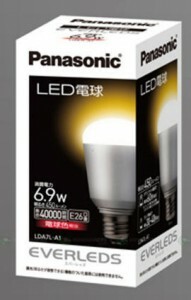 Panasonic’s LED lightbulb costs $40, but it lasts almost 20 years. More info here.